This tutorial covers the use of the HTML5 Web SQL API in Enterprise Browser for storing and retrieving data. Enterprise Browser includes support for the HTML5 Web SQL API for managing data. The steps shown below are typical for code that uses the API. This tutorial will walk through the creation of a working example application using these steps. Back button that returns the user to the Enterprise Browser start page. Quit button that exits Enterprise Browser. Styling to size components in an appropriate manner for use on a device. Create a directory on your development machine for application files. Create a file named websql.html in your application directory and open it in a text editor. Copy the contents of the starter template above into the file and save it. Add two input buttons in the bottom of the content div section using the code below. The first button will be used to add records to the database. The second will erase all records from the database. 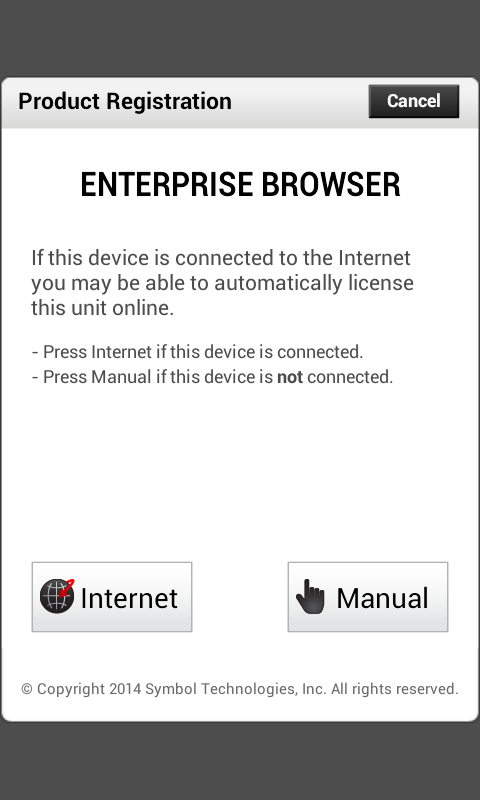 The Enterprise Browser app's config.xml file holds several settings that affect WebSQL databases. The path shown here is valid for Android. The path for Windows Mobile/CE will vary slightly. Copy the config.xml file from the Enterprise Browser install directory on the device to a suitable location on the development machine and open it in a text editor. Update the WebSQLDBPath setting to point to the location on the device where you plan to install the application. Copy the config.xml file back to its original location on the device. The first line of code tests to see if the current browser supports WebSQL. 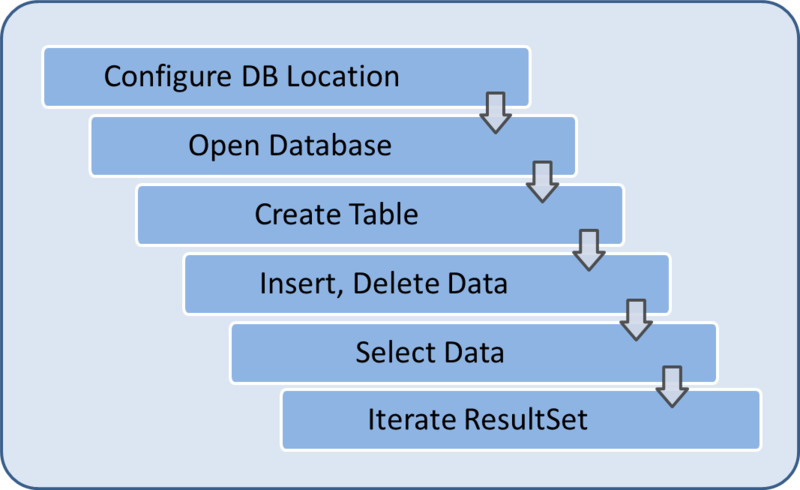 The openDatabase() method on the next line opens a database and assigns it to a variable for later use. In the lines that follow, a 'SQL table create' statement is executed within a transaction. When this method is finished running, the database will be available to execute additional SQL statements for inserting and deleting records. The fnDbDisplayData() method used in the code above will be created in a later step. 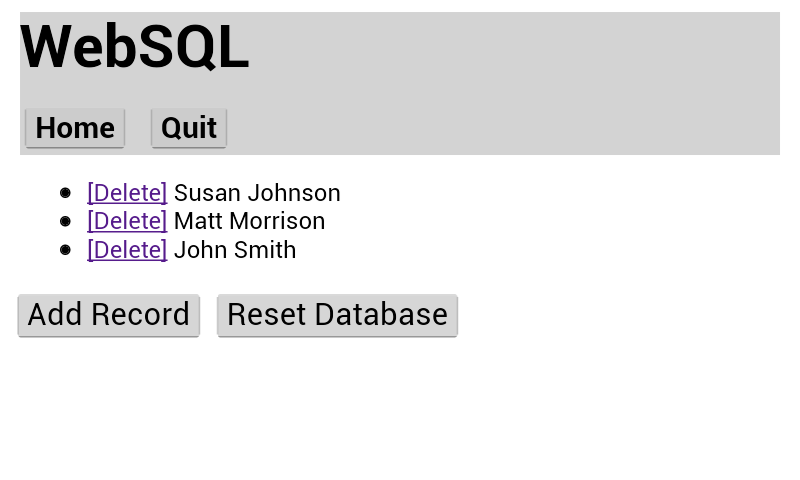 This method executes a SQL statement to insert data into the Items table. For demo purposes, the data in this case is being provided by the fnMakeName() method, which returns a new randomly generated name each time it is called. In a real application, you might get data from input fields filled out by the user. Data can be deleted by individual records or by deleting all records at once and resetting the database. We'll give you both methods. 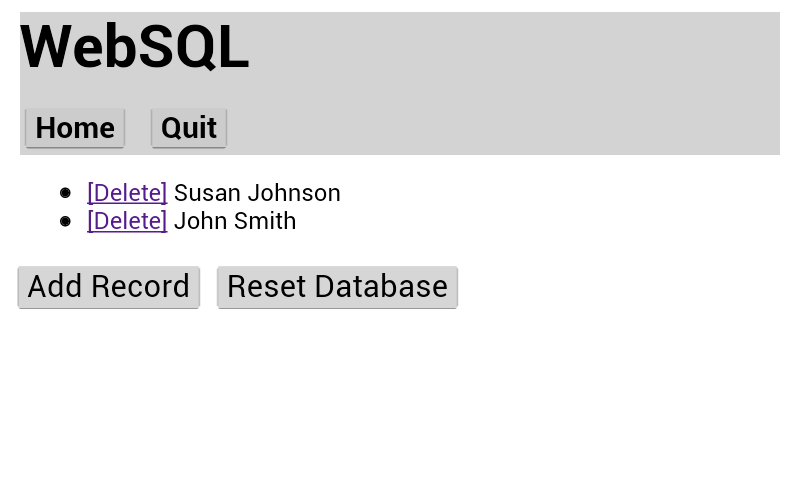 An id gets passed to this method, which it uses to execute a SQL delete statement for the given record. This method executes two SQL statements. The first statement drops the existing table and all its data. The second statement recreates the table. You may have noticed that we have been calling fnDbDisplayData() after each data operation. This method refreshes the screen with the latest contents of the database table. The first line of this method deletes the current contents of the db-results display area on the screen. After that a SQL select statement is executed to retrieve the contents of the Items table. The third parameter of the executeSQL() method is an anonymous callback function that is executed as soon as the select is complete. The result of the select statement is passed to the callback function, which then iterates through each result and adds it to the db-results display area on the screen. Note how the data being inserted into the page includes a delete link for each row that can be used to call fnDbDeleteRecord with the record id for that row. To test the application, you need to copy the application files to the device and set the StartPage setting in the Enterprise Browser config.xml file. Android- and Windows-based devices use different methods for transferring files. Please see the documentation for your device for specific instructions on copying files. 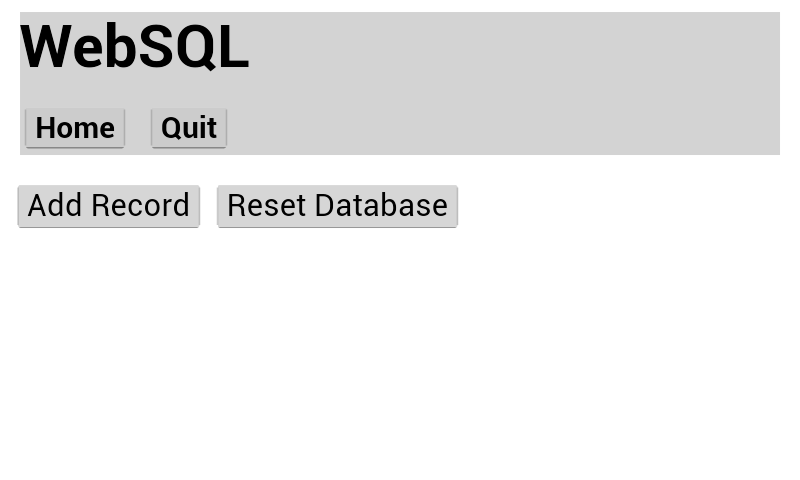 Create a directory on your device for the WebSQL application. Make sure the directory is in an unrestricted location to avoid any permissions issues when Enterprise Browser tries to open the files. We'll place our sample app's files in the device's root directory and show you how to modify the config.xml file accordingly. Copy the config.xml file to a suitable location on the development machine from the Enterprise Browser install directory on the device and open it in a text editor. Update the StartPage setting in config.xml to point to the location on the device where you placed websql.html and save the changes. Click on the Add Record button a few times to create and add records. Press the delete link for one of the records to delete that record. Click the Reset Database button to erase the remaining record. This completes the Enterprise Browser Web SQL API tutorial. More information about the Web SQL API, please visit the W3C's Web SQL Database page.